I had already planned out the menu for Mike's birthday dinner when this salad was posted on Mel's Kitchen Cafe. It looked so yummy and fresh I couldn't resist and decided to add it last minute to our dinner plan. I even went back to the store for the ingredients. I'm so glad I did! This was the perfect side for a summer BBQ...or any summer meal. 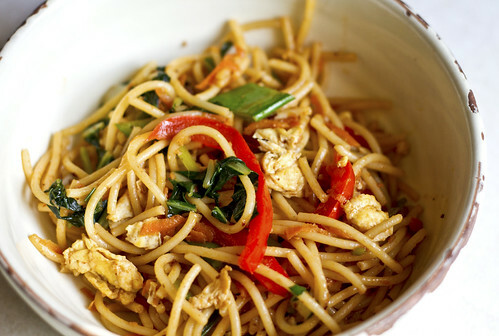 It is full of fresh flavors and light and crunchy and pretty much perfect. Everyone who tried it looooved it, and I used the leftovers in a quesadilla the next day and it was equally heavenly! Bring a large pot of water to a boil. When boiling, add one tablespoon sugar and one tablespoon vinegar. Add the cobs of corn to the pot of water and bring to a rolling boil. Cover the pot, remove from the heat and let the corn sit for 10 minutes. Remove the corn from the pot. When the corn is cool, cut the kernels off the cob, cutting close to the cob. 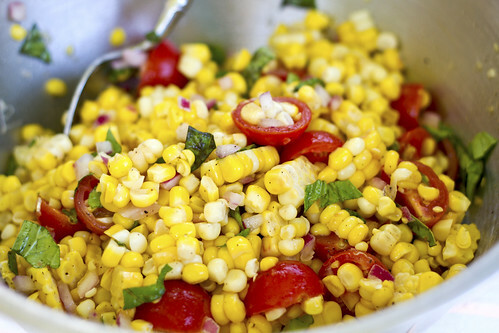 Toss the kernels in a medium bowl with the red onions, tomatoes, vinegar, olive oil, salt, and pepper. Just before serving, toss in the fresh basil. Add additional salt and pepper to taste, if desired. Serve cold or at room temperature. I LOOOOVE raspberries! They are one of my favorite things to eat and definitely my favorite berry, so when I saw the gorgeous pictures of these in my Better Homes and Gardens magazines I knew I would get around to making them. Mike's birthday presented the perfect occasion and they received rave reviews from everyone. They are SO good and super easy to make too. 1. Preheat oven to 350 degrees F. Line a 13x9x2-inch baking pan with a 24-inch-long sheet of aluminum foil, leaving extra foil extending over ends (use these later to lift bars from pan); set aside. In a large bowl beat the butter with an electric mixer on medium to high speed until it just begins to blend and soften slightly, about 30 seconds. 2. Add brown sugar and salt, beat on low speed until incorporated, 30 seconds to 1 minute. You're not trying to cream it, you're just mixing it in, Scott says. With mixer off, add the 2 cups flour. Beat on low speed until flour is incorporated. Increase speed to medium, mix until ingredients form an even, cohesive dough. 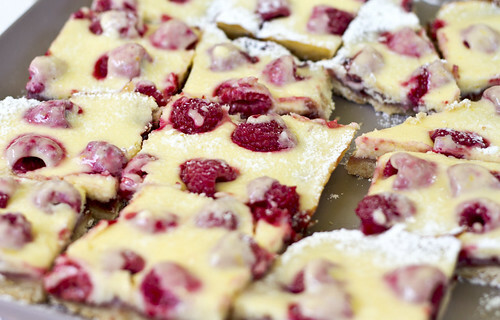 "People tend to undermix shortbread, which makes it too crumbly," Scott says. "It's tough to overmix because of the amount of butter we use." 3. Break dough into small chunks and distribute in prepared pan; with your fingers press dough into an even layer. Bake 20 minutes or until dough has begun to puff and is just set. Cool on wire rack 5 minutes. 4. Lightly brush exposed sides of foil with softened butter to keep filling from sticking. Spread jam evenly over crust. 5. Sprinkle evenly with raspberries. 6. With a lemon zester, remove peel from lemon, making sure to avoid bitter white pith. "For the most flavor, you want to do this right before baking," Scott says. 7. In a large bowl beat cream cheese and goat cheese with an electric mixer on medium to high speed for 30 seconds. Mix in granulated sugar and 1 tablespoon flour until blended. With mixer running, add egg, egg yolk, lemon zest, lemon juice, and vanilla. Beat until smooth. 8. Pour custard batter evenly over berries. Tilt pan back and forth to distribute evenly. Bake at 350 degrees F for 25 to 30 minutes or until barely set. Transfer to a wire rack until completely cool, about 1 hour; cover and transfer to refrigerator. Chill 2 hours. Top will crack slightly as it cools. 9. Use foil to lift the bars from pan. With a knife or metal spatula, support the sides of the bars while you gently peel the foil downward and away from sides of the bars. Sprinkle very lightly with powdered sugar. "It's much more interesting with just the rumor of sugar on top," Scott says. Makes 24 bars. Although the kids weren't thrilled with this Rachael Ray meal, Mike and I loved it...especially me! And the leftovers for lunch the next day were just as good. I'll add more of the bok choy next time, but overall I thought it was perfect. I loved all the fresh veggies and the sauce had a great flavor to it! Directions:1.Bring a large pot of water to a boil, salt it, add the pasta and cook until al dente. Drain. 2.While the pasta is working, in a large skillet or wok, heat 1 tablespoon vegetable oil, 1 turn of the pan, over high heat. Add the eggs and scramble until firm. Transfer to a plate. Add the remaining 2 tablespoons vegetable oil, 2 turns of the pan, and heat until smoking. Add the bok choy, bell pepper, scallions, carrots and snow peas and stir-fry for 2 minutes. Add the ginger and garlic and stir-fry for 1 minute more. 3.In a small bowl, stir together the tamari, black bean sauce, lime juice, hot sauce, honey and sesame oil. 4.Toss the pasta with the sauce and vegetables. Top with the egg.